As the name suggests, helicopter parents hover over the lives of their children in an attempt to mould and shape not only the way a child develops, but also the direction they will take into adulthood. 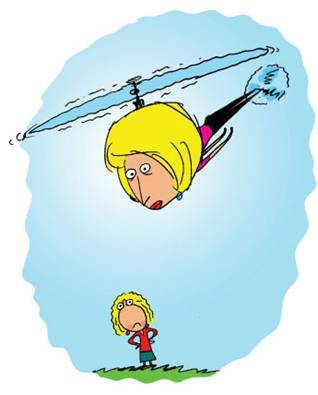 Helicopter parenting often takes the form of micro-managing every aspect of their lives. Manifesting itself in many ways, this type of parenting is largely a product of the 21st Century and can possibly be attributed to the information age in which media-driven concepts about the things we should be achieving in life, can lead to unnecessarily high expectations. To begin with, it is important to emphasise that helicopter parenting, however misguided it might be, is done out of love and with the best of intentions. However, the end result is often not what the parent (who has invested a huge amount of emotional energy in the process) expects it to be. Critics of helicopter parenting point out that by overly interfering in the life of a child, what is actually happening is that the child is being shielded from normal learning experiences that result from making choices, facing up to and dealing with problems or negative experiences and finding a direction in life. Imposing abnormally high expectations, constantly swooping in to resolve issues or situations and not allowing a child room to find solutions to their own problems, can not only result in a young adult with no concept of how to accept responsibility or take a risk in life, but can also be very damaging to long-term self-esteem. Of course there is a balance to be found here as there is in all things. Parents must learn to distinguish between occasions where it is absolutely necessary to intervene and those where the intervention is actually only likely to prevent the child from having a valuable learning experience. Choosing the right moment to resist the urge to rush in and make everything right or make the pain go away is a fine line to tread, and one that requires a significant amount of self-awareness on the part of the parent. There are of course, many occasions that will require parental intervention, but perhaps the intervention might benefit from being a little less overt. But if we turn the focus away from the child for a moment and put the parent in the spotlight, it is easy to see that the helicopter parent also bears a significant share of personal cost. You may spot them exhausted and yet rushing around to drop their children at a huge range of extracurricular activities. Shouldering the responsibility for ensuring that their children are exposed to the “right” activities to shape a significant future path that will fulfil the expectations placed upon them. Consider for a moment the heavy burden of expectation this parent carries both in terms of outcomes for their children and also in terms of their perception of what society expects from them as parents. They may be experiencing abnormally high levels of anxiety, physical and emotional exhaustion and even a sense of alienation from the very children that they are trying to mould. This internal struggle can only impact negatively on the long-term well being of the children and indeed the family as a whole. It is highly unlikely that you will influence the long-term life direction that your child takes as an adult regardless of what you do. It is just as unlikely that your child will stand out from the crowd and become famous, abnormally successful or renowned, regardless of the decisions you make on their behalf. By handing everything on a plate to your child, you take away their opportunity for appreciation. Refusing to allow your child to get into negative or painful situations is also a refusal to allow them to learn and grow. Allowing yourself to suffer constant worry, stress and exhaustion cannot be good for you, your children or your family as a whole in the long-term. Unconditional love and support will win over micro-management every time. The tighter you cling to someone the more you push them away. Most people are going to find their own way in life and yes – it is going to be okay in the end! For more information on Digital Parenting please search for “Vodafone Parents’ Guide”.